Home > Ageing & Ear Health > What is Otitis Externa? Otitis is a medical term used to describe infections that affect the ear. Otitis media is an infection of the middle ear; otitis externa describes inflammation caused by an infection of the outer ear, the visible flaps of skin and cartilage that we usually just call ‘the ear’. The usual culprits are bacteria, usually those that normally grow on the skin without causing any problems, or fungi, such as yeasts. Ear infections of the external ear can occur at any age and may follow an injury or be unrelated to any specific event. Otitis externa is, however, more likely to occur in older people, possibly because their immune systems are not as effective. One of the most common ways for otitis externa to develop is through self-injury, not done intentionally, but in scratching an itchy ear. The pinna of the ear is very prone to reacting against chemical irritants in the environment – to shampoo, perfume, smoke, hair spray – and so on. Poking and scratching inside the flaps can disturb the skin, causing breaks that are big enough to give bacteria or fungi a way in to set up a localised infection. External ear infections are much more common in people who swim a lot, particularly in swimming pools that are highly chlorinated. This irritates the skin of the ear. Infections can also arise in swimmers because their ears are more often wet, and drying more carefully after a thorough post-swim shower can help avoid the problem. Damp and hot weather can also make it more likely that you will develop an ear infection if you are prone to them. Travelling to a hot and humid location on holiday can precipitate otitis externa, and you should always take your usual treatment, perhaps an antibiotic cream, whenever you visit tropical climates. Underlying skin or middle ear problems can also lead to external ear infections. If you have psoriasis or eczema, you are more likely to scratch the ear, and fungal infections are very common in people whose skin condition is flaring up. The discharge from otitis media can increase the amount of pathogenic bacteria on the skin of the outer ear, which can then set off an infection there. For the purposes of defining otitis externa, the ear canal, inside the ear but not inside the ear drum, is regarded as the outer ear. Otitis externa that extend to the ear drum can therefore affect hearing, particularly if the amount of discharge produced is significant and prevents sound waves hitting the ear drum in the normal way. The local skin infection in the ear canal can affect the layers of skin hidden from view, and be more difficult to treat; it is normal for this type of otitis externa to result in painful and swollen neck glands as your body tries to fight it off. To do this effectively, you need to think about what sets a bout of otitis externa off in your particular case. If it is a response to irritates in shampoo, for example, adding a little Vaseline to the folds of the ear and inside the ear canal before washing your hair can help, as this acts as a pretty good barrier. If swimming is a major cause, showering well and then making sure the ears are dry can help. It is important, however, not to poke a towel into the ear or use cotton buds – drying with a hair dryer can be better, using a warm rather than a hot stream of air. You can also try silicone ear plugs, or a swimming cap to keep water out of the ears, but neither of these can be 100% effective. The usual treatment is an antibiotic and a steroid, applied to the outside of the ear in the form of a spray, or in ear drops if the infection is inside the ear canal. 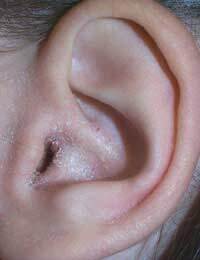 This usually works well within about a week but you must avoid poking the ear, or trying to clean the ear with cotton buds as the damage will irritate the tender tissue further, making the problem worse. Painkillers bought over the counter can help if the ear has become painful; if the problem doesn’t resolve within a few days, you should consult your GP as oral antibiotics may be needed. Do you Have a Ruptured Eardrum? I have suffered from liquid wax in my inner ear for about 4-5 yrs, this causes the skin on my outer ear severe dryness, itchyness and with painful flaky skin. I have been to my doctor numerous times and had several treatments consisting of antibiotics, ear spray and drops, as well as self treatment via the use of vaseline and olive oil. Whilst using the antibiotics and prescribed ear sprays/drops the problem clears up but as soon as I finish the course of treatment the problem comes back. My ears cause me immense discomfort and pain any solutions to my predicament would be more than appreciated.